Chinese naval technology was well advanced over that of the Europeans. By the 11th century they had a fleet of ocean going junks which were extremely sea worthy. They were also immense as the picture above shows. They could reach well over 400 feet and be over 150 feet wide. There were several decks below the main deck and several decks above at the stern of the ship. They were typically complemented with a crew of any where between 450-700 members and they remain some of the largest wooden vessels ever built. They were able to handle deep ocean weather due to their very deep, sharp keel which gave them more stability, that fact combined with water tight compartments made for a very sturdy ship. However, even with all their technological adaptations during their first expeditions they never sailed very far from land though there is solid evidence that they sailed all the way to the eastern coast of Africa and possibly even Australia. (1) Thus it seems the only limitation to Chinese exploration was the tenacity and daring of their leaders , however, recent evidence seems to suggest that they may have been much more daring than anyone dare believe. 2-Levathes, Louise. 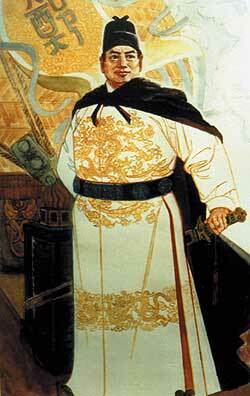 When China Ruled the Seas: the Treasure Fleet of the Dragon Throne 1405-1433. New York: Simon & Schuster, 1994. Print. 3-Menzies, Gavin. 1421: the ear China Discovered America. [New York, NY]: William Morrow, 2003. Print.